This 3" x 5" reference guide clearly and concisely outlines what you need to know about NIMS objectives, whether you're at the local, state or federal level, and in private industry. The all-hazards, non-jurisdictional or discipline specific guide also provides responsibilities and checklists for applying the Incident Command System (ICS). 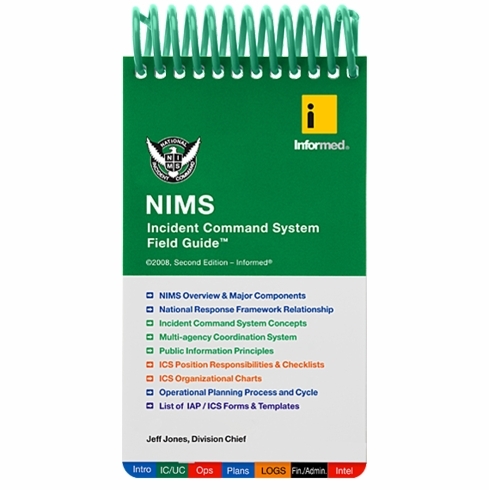 The new second edition features an expanded and improved section on the Operational Planning Process, improved checklists for all functional positions, updated information on the relationship between NIMS and the National Response Framework (NRF), and expanded information on Multiagency Coordination Systems and Joint Information Systems. Tough, waterproof, and alcohol-fast, this handy guide can be used for NIMS and ICS training, during training and functional exercises and, most importantly, in the field where you need it most. Combine this guide with your training and feel confident that your NIMS compliance requirements are met.